The arguments in the matter remained inconclusive and the court fixed the matter for further hearing on February 5. New Delhi: The Supreme Court on Friday sternly said that it was concerned only with the death of special CBI judge BH Loya, and would not go into other aspects including BJP chief Amit Shah's discharge in the Sohrabuddin Sheikh fake encounter case. The top court, which is hearing petitions seeking an independent investigation into Judge Loya's death in 2014, made it clear that the issue before it was whether further probe should be ordered into it or not. 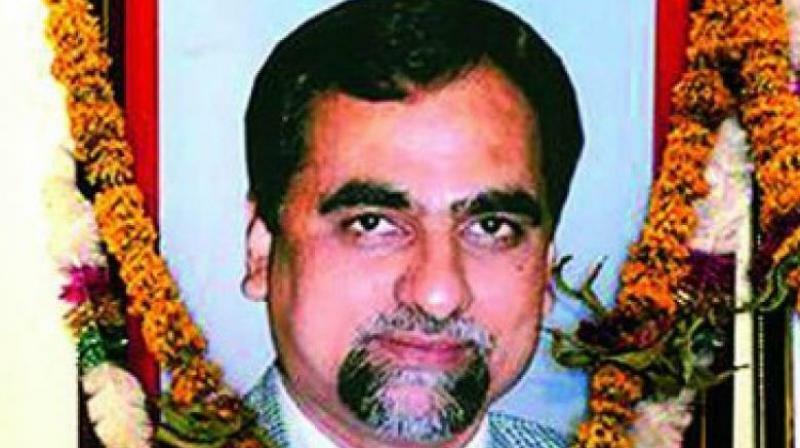 Judge Loya, who was hearing the Sohrabuddin Sheikh case, died of cardiac arrest in Nagpur on December 1, 2014, when he had gone to attend the wedding of a colleague's daughter. After his death, special judge MB Gosavi, who took over the trial, had discharged Amit Shah and some other accused. When the petitions seeking an independent probe into Judge Loya's death came up for hearing before a bench headed by Chief Justice Dipak Misra, one of the advocates said he had filed a plea in the Bombay High Court, which has now been transferred to the Supreme Court. He said he had made Amit Shah one of the respondents. When the lawyer sought that notices should be issued on his plea, the bench said, "We will permit you to argue. There is no question of issuing notice." "We are only concerned with the death of the judge. We are not on other cases at all. This message must go loud and clear," the bench, also comprising Justices AM Khanwilkar and DY Chandrachud, said. When Amit Shah's name was raised, senior advocate Mukul Rohatgi, representing the Maharashtra government, said, "This is the real purpose of these petitions". Senior counsel Dushyant Dave, representing Bombay Lawyers Association, said it was a "very serious matter" and it would be proper if pleadings in the case were completed first. Referring to a report by Commissioner of Intelligence (CID) of Maharashtra, Dave said an independent probe was required as it contained "bundle of discrepencies" and "contradictions". At the last hearing, Dave was warned by the top court against casting aspersions on Shah in the case, and on Friday he said that the same set of advocates, who had defended the BJP chief in the matter, were now appearing for the state. Senior advocate V Giri, representing Congress leader Tehseen Poonawalla, who has also sought a probe into Judge Loya's death, raised questions about the veracity of reports filed by the state, and said the records must be placed before the court. Rohatgi countered the submissions, saying "Except for maligning the judiciary and have (media) glare, there is something more to it. We have given the entire records, please see that," Rohatgi told the bench. To this, the bench told Dushyant Dave, "Let us have a bird's eye view of your case and let us see what the documents are." Dave narrated the sequence of events prior to and after Judge Loya's death, and said serious questions have been raised about what had really happened since there were "overwritings" on several crucial documents. Dave wanted to know how special judge JT Utpat, who was hearing the Sohrabuddin Sheikh case before Judge Loya took over, was transferred, and said the circumstances warranted an independent probe. He said the CBI had not appealed against the discharge of Amit Shah, while it did move court to challenge the discharge of some police officials. When he said a "third person" accompanied Judge Loya's body to his native place, Rohatgi referred to the statements of district judges that said two judicial officers had gone with his mortal remains. Dushyant Dave, however, insisted that family members of Judge Loya were "kept in the dark", and claimed that statement of Judge Loya's wife was taken under pressure. "Please call his wife, father and sister, and talk to them in chamber. If they say that they do not want any probe then we will not say anything," he said, and alleged that Judge Loya's son was also under pressure. Terming the discharge of Amit Shah in the Sohrabuddin Sheikh case as "extraordinary", he said, in such a serious matter, an independent probe was needed, and the court should not "throw out" the petitions at the threshold. Senior advocate Indira Jaising, appearing for one of the applicants, said the state should be asked to produce the original records, including the register of the government guest house, where Judge Loya had stayed in Nagpur, and his ECG report. Rohatgi said he would show the original records. Judge Loya's death came under the spotlight in November last year after media reports quoting his sister fuelled suspicion about the circumstances surrounding it, and its possible link to the Sohrabuddin case. However, Judge Loya's son Anuj had on January 14 said in Mumbai that his father had died of natural causes and that the family does not want any further investigation. During the hearing on January 22, the top court had restrained other high courts from entertaining any petition relating to Judge Loya's death and transferred to itself the pleas pending before the Bombay High Court.